Asinara is the second largest island in Sardinia. It is an amazing paradise with lots of untouched beaches and the water is crystal clear and sparkling. As lovely as this sounds this island was once known as ”Devil’s Island”. This was due to the fact that at one time it was a quarantine camp during WWI and became a high security prison in the 70s and 80s. The Asinara National Park was founded in 1997 in order to protect the natural habitats of species which are endangered. It has a delightful Mediterranean climate. There are rocky cliffs, small beaches, wide inlets and lots of fantastic views. 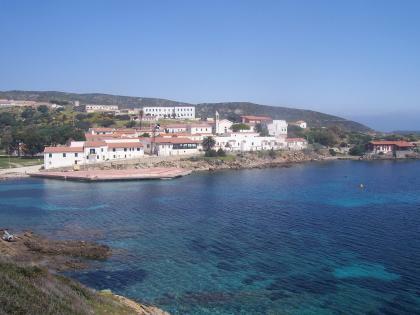 A great deal of the history of Asinara is unknown. Here you can find Neolithic tombs which are called domus de janas or fairy houses. These are dug out of rock and are proof that the history stretches back at least as far as the Neolithic Era. From Medieval times there is the Sant Andrea Monastery and the Castellaccio on the Punta Maestro in Fornelli. There is a community of shepherds and fishermen near the town of Fornelli. More than 700 specific and important plant species can be found here. Among the animals that make their home here are the Corsican red deer, osprey, Mediterranean monk seal and mouflon. Altogether there are 80 different species of mammals, reptiles and amphibians. 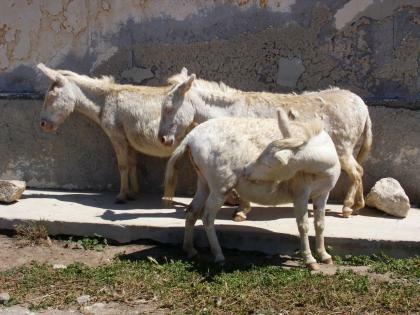 Visitors can get to see rare animals such as the Albino donkey and pygmy Algryoides, Sardinian Barn Owls and Cirl buntings. The national park protects these species. Among the places which are of special interest to visitors are the Fornelli area and it can be reached by sea or road. Here you can visit the prison that was built in the 19th century. There is a beautiful garden which was created by prisoners in the 80s. There is La Reale once known as Lazzaretto and was the center that was used by ships to quarantine crews that were infected. The royal Savoia family at one time made many trips to the island. The entrance to Palazzo Real is well known for its amazing architecture and it is looked upon as the seat of the Asinara National Park. There is also a most charming village Cala d’Olivia which has old-fashioned cobblestone streets. There is an old section and a new section where visitors can see larger buildings. In the center of the village is a small square with an old church. Visitors can get to know how the residents of this coastal Italian village lead their lives.